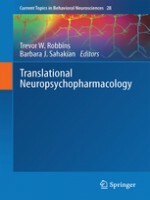 This book covers wide areas of animal and human psychopharmacology with clinical utility in the treatment of psychiatric and neurological (e.g Alzheimer's disease) disorders. The main theme is to develop a new paradigm for drug discovery that questions the claim that animal models or assays fail adequately to predict Phase 3 clinical trials. A new paradigm is advocated that stresses the importance of intermediate staging points between these extremes that depend on suitable translation of findings from animal studies to Phase 1 or Phase 2 studies utilising experimental medicine.